I’m an adventure-seeker who likes to skydive, cycle, downhill ski, climb and surf. Like many guys out there I also love a consistent, vigorous exercise routine. Something about pushing my physical and mental limits keeps me in balance when the stress and anxieties of daily life start creeping in. But here’s the thing: over the past 10 years I’ve had a membership to many different gyms. I did the rough math and I probably spent over $20K in membership fees. As I was progressing in my career I found myself spending more time at work in front of a computer, inside massive steel buildings of trade shows or surrounded by white walls during meetings with clients. The last thing I wanted to do at the end of the day was to go to another big, sterile building to workout! About 5 years ago I decided I needed a change. I wanted to orient more of my time around my passion for the outdoors and adventure. 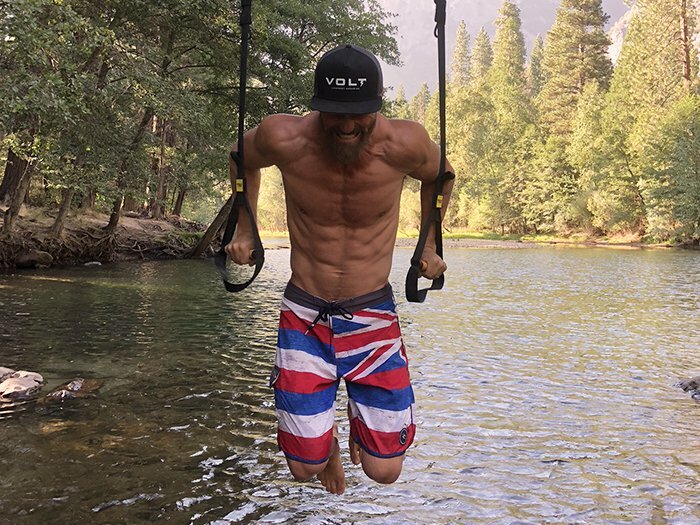 I officially kicked my “gym habit” to the curb in favor of a flexible, go-anywhere, outdoor workout routine that helps me stay fit and connect to nature at the same time. I started working out at the beach using lifeguard stations as my support, at playgrounds hanging off the monkey bars while watching my kids to play and, eventually, I built my own outdoor pull up bar station at my house. Consistently working out in this way has also changed my body for the better. I’ve developed different muscles, a stronger core, and a more natural-looking build when compared to my old weightlifting routine. If you’re also ready to trade in the gym for more time outdoors, I would highly recommend getting a TRX Strap (@trxtraining). 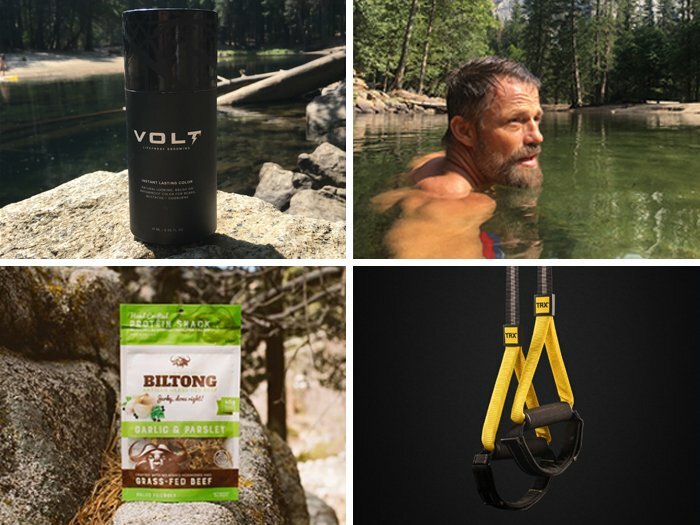 Recently, I took this simple workout to one of my favorite off-the-grid destinations—Yosemite National Park. While the woods naturally provided tons of places to suspend my strap, my favorite place to “hang” that week was a bridge, just above a gently rushing river. The calming, white noise was a better workout soundtrack than any playlist I could put together! My after workout protein of choice when I’m in the wild is California Biltong (@jerkydoneright). If you’re not familiar with it, it’s a South African-style beef jerky that’s becoming more popular in the States. This biltong is made with all-natural, preservative-free and grass-fed beef. It’ll be the most flavorful jerky you’ll ever taste. I take every opportunity I get to test VOLT products during my adventures. Here, I’m using VOLT Instant Beard Color. As you can see, it stayed put during the routine and my post workout swim. If you’re looking for beard color that stands up to whatever life throws at you, learn more and find your shade here.